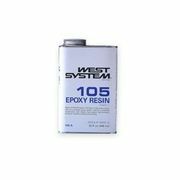 105 Epoxy Resinå¨ is the base material on which all West System 105 System epoxy compounds are built. The resin is a clear, pale yellow, low-viscosity liquid epoxy resin. Formulated for use with West System hardeners, it can be cured in a wide temperature range to form a high-strength solid with excellent moisture resistance. 105 Resin is designed specifically to wet out and bond with wood fiber, fiberglass, reinforcing fabrics and a variety of metals when mixed at the proper ratio with a West System hardener. An excellent adhesive, 105 mixtures will bridge gaps and fill voids when modified with West System fillers and can be sanded and shaped when cured. With roller applications, it has excellent thin-film characteristics to flow out and self-level without ‰ÛÏfisheyeing.‰Û� 105 Resin/207 Hardener mixtures cure clear so you can achieve a natural finish when coating with varnish.